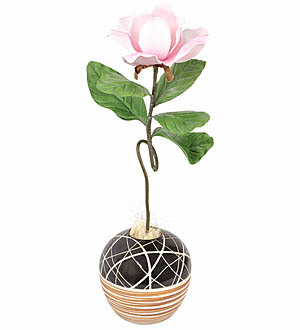 Elegance and originality are the keynotes of this Magnolia Flower in a round Royce Vase arrangement. Chic and very stylish, the Vase is lined with a single stem of Magnolia Flower. Cool and modern - without being consciously trendy - this new look for Magnolia show all the signs of becoming a contemporary classic. Magnolia Flower Stem measures 69cm in length and the flower 11cm in diameter.